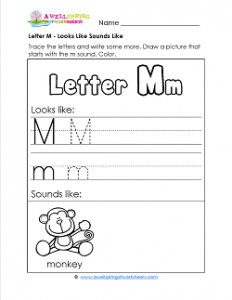 Now here’s a marvelous letter m looks like sounds like worksheet! Kids get to trace and write the uppercase and lowercase letter Mm on the primary writing lines. A little bit of practice here, a little there, and before you know it they’re printing like champs. Then they get to draw a picture of something that starts with the m sound. Here’s a few for starters: money, Mars, mother, milk. What other words will your kids come up with? Of course, please color, including the “Letter Mm” at the top of the page.